JK Gourmet’s new honey-sweetened artisan chocolate comes in four tempting flavours: roasted almonds, almonds & blueberries, almonds & cherries, almonds & black currants. 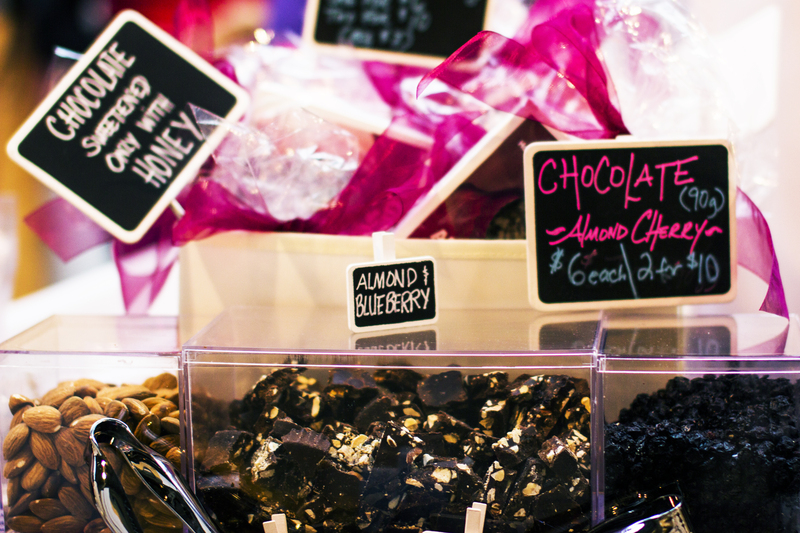 But no need to feel guilty for indulging—it’s made with raw, organic, fair-trade, dairy-free Ecuadorian dark chocolate! Celiac may be the first disease most people associate with gluten free, but for JK Gourmet founder, cookbook author and colitis sufferer Jodi Bager, going “g” free (as in gluten and grains) was a key ingredient to being symptom free for the past 16 years. Launched in 2001, JK Gourmet makes natural whole foods and baked goods—free from grains, gluten, sugar and preservatives—that taste out of this world and make you feel great, regardless of your reason for going gluten free. JK Gourmet was one of the first of its kind to bring choice grain-free ingredients together with culinary expertise (and far too many health benefits to list) and stays on top of the trade by coming out with irresistible new products on a regular basis. We’ve been huge fans of JK Gourmet’s granola forever and these days we can’t get enough of their new artisan chocolate (drop by the JK booth at Gluten Free Garage and taste for yourself!). But with the fall season well underway, nothing makes us feel as warm and cozy as this rustic apple pie, made from none other than JK Gourmet’s famed almond flour. 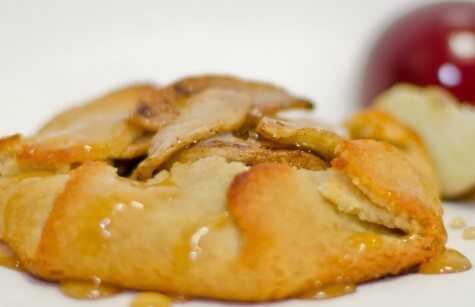 Rustic apple galette made with JK Gourmet Almond Flour. A galette is a French word given to a free-form rustic pie that is made without a pie plate. In this galette, the apples are precooked on the stove and then poured onto the pie crust, which is then folded around the pie with an opening at the top. It is very easy to make, as it requires no crimping or shaping and it does not at all matter if it is lopsided. Combine all ingredients into the work bowl of a food processor and pulse until coarse and crumbly, or mix all ingredients by hand until they come together in a ball. Flatten the dough into a round disk between two large pieces of plastic wrap and gently roll out the crust into a 12-inch round. Put the dough, still between the plastic wrap, on a baking sheet and in the fridge while you make the filling. Add apples and honey and cook until they begin to soften. Add cinnamon and cook for another minute. Working quickly, remove rolled-out crust from the fridge and peel off one side of the plastic wrap. Put the crust down on a cookie sheet lined with parchment paper and remove the top layer of plastic wrap. Pile the apples in the centre of the dough, leaving a 3-inch (8 cm) border of crust around them. Use parchment paper to help fold the border of the pie crust over the apple mixture and pinch together any tears in the dough. If at any point during this process the dough becomes too soft, return it to the fridge for 5 minutes and continue when it is cold. Bake for 30 minutes until the crust is golden brown. Posted in GFG sponsor!, GFG updates, Happiness is..., Products we ❤, Recipes we ❤, Tummy love.